We are a brand new small hostel in the central part of Gran Canaria, in Vega de San Mateo. We created a warm, welcoming place for those who want to escape from the crowded cites for a couple of days. This is a place to find beauty outside (nature, traditional architecture, art) and inside (body, soul and mind). We have 5 rooms, a garden and a big land. We have two terraces with spectacular view and a large rooftop terrace where you can get plenty of sunshine. We have 2 shared bathrooms and a big patio with hundreds of local plants and flowers. You can cook in the kitchen but we also offer food, you can ask for the menu (breakfast or dinner). 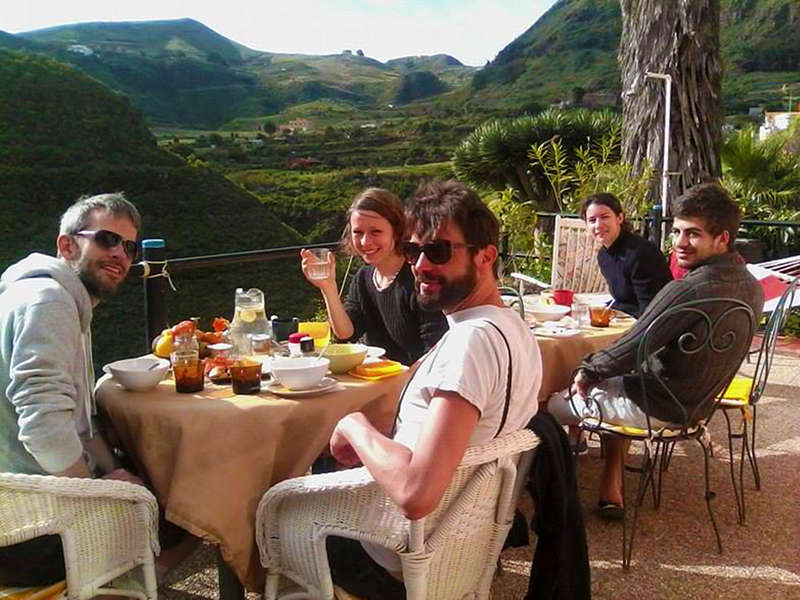 The hostel is located on the hill side of Valley de Mireles facing to a large, sunny valley in San Mateo. The village is very small and surrounded by beautiful hills. After big rains you can see rainfalls in the area. In Vega de San Mateo you can visit the farmer's market every weekend, and try local food. The biggest horse riding place is also located in this town and the area is famous for hikers too. This is also the route to reach the highest peak (Pico de Las Nieves) by bike or walking. Camino Art Hostel is located in Vega de San Mateo on Gran Canaria. Our 90 years old building is facing to the fabulous valley of Mireles and was known as the Finca de Mireles. By car from Las Palmas: take direction to Tafira – Santa Brigida – San Mateo. We are by the road GC15, around the km 9,4. By car from the Airport: take direction to Las Palmas, before the city keep left and take the road to Galdar/Tamaraciete. Keep right and take the exit to Tafira, follow the road to Tafira/Santa Brigida, and later direction to San Mateo. We are by the road GC15, around km 9,4. By car from the center of the island: take the road GC15 from Tejeda for example, we are by the km 9,4. Please respect our parking rules. You can park by the road behind the line starting from the bottom part of the side rail upwards. By bus from Las Palmas: take nr303 from San Telmo park (main bus station in Las Palmas) and get off at the stop called: Vuelta el Chorillo. Walk 300 meters back downhill on the same road until you find the hostel by the road. We are behind the big white building. Ticket is 2.55€ one way. By bus from the Airport: take the bus nr60 to San Telmo park in Las Palmas and change to bus nr303 to San Mateo. Get off by the stop called: vuelta de Chorillo, and walk back downhill on the road about 300 meters until you find the hostel. Ticket is 2.45€ (airport-LP) and 2.55€ (LP – SM). We have 48 hours cancellation policy, which means, if you cancel in shorter term, you will be charged with full amount of you booking fee.